while Michael, a.k.a. Jesus, was visiting this planet. And Barrie nicely writes back. Try the SSG List from Dallas 2005. Put on your tinfoil hats. Folks, this is the pitch for the Urantia Book . . .
which includes an eight hundred page biography of the life and teachings of Jesus that claims to be given by the apostle Andrew’s guardian angel. 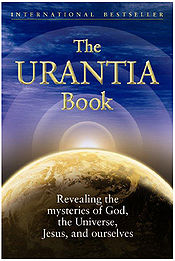 The Urantia Book’s account of the resurrection is far more detailed than the New Testament, providing more appearances of Jesus to various believers. The Urantia Book says the angels performed a time-accelerated elemental disintegration of Jesus’ body and this has intriguing correlations with the image found on the Shroud of Turin. It says that Jesus’ resurrected body was like that of angels and that his physical body still lay in the tomb after the resurrection and that the angels were given permission, upon request of an archangel, to cause the accelerated dissolution of his physical remains. This permission was requested and granted so that they would not have to witness the decay of his body. The correlations have primarily to do with the superficial nature of the image and current theories about corona discharge and nuclear medicine imaging . Additionally, there are intriguing correlations related to the Sudarium of Oviedo, a face napkin said to have covered Jesus’ face as part of the burial process. It helps to understand that the UBers believe that Jesus was the name that the most senior angel, Michael, the ruler of Nebadon, used, temporarily, after the incarnation and before the resurrection. The administrative angel Gabriel, his second in command, ruled the universe while Michael, a.k.a. Jesus, was visiting this planet. He is currently using the name Michael, not Jesus. According to The Urantia Book, multi-colored human races originated suddenly in one generation and in one family, producing brothers and sisters that variously turned blue, yellow, red, green, orange, and indigo when exposed to sunlight. Their offspring subsequently favored the parent color. Later, Adam and Eve produced a violet race. In the book’s account, the blue, yellow, and red races were considered “primary”, and the green, orange, and indigo “secondary”. The green and orange races were driven to extinction, and the rest mixed over time. I have no problem with whatever someone chooses to believe. That is just as true if someone is a follower of Urantia Book, an Atheist or a member of any number of religions and religious cults with which I disagree. If they publish and promote on the internet, then I am entitled to criticize in the same venue. It’s not about sides. It is about truth and if the truth is ultimately that I was wrong and the shroud is a fake, then that is the side I’m on. At ten minutes past three o’clock, as the resurrected Jesus fraternized with the assembled morontia personalities from the seven mansion worlds of Satania, the chief of archangels—the angels of the resurrection—approached Gabriel and asked for the mortal body of Jesus. Said the chief of the archangels: "We may not participate in the morontia resurrection of the bestowal experience of Michael our sovereign, but we would have his mortal remains put in our custody for immediate dissolution. We do not propose to employ our technique of dematerialization; we merely wish to invoke the process of accelerated time. It is enough that we have seen the Sovereign live and die on Urantia; the hosts of heaven would be spared the memory of enduring the sight of the slow decay of the human form of the Creator and Upholder of a universe. In the name of the celestial intelligences of all Nebadon, I ask for a mandate giving me the custody of the mortal body of Jesus of Nazareth and empowering us to proceed with its immediate dissolution." The Jewish leaders began the sordid business of supposedly getting rid of Jesus by offering bribes to the traitorous Judas, and now, when confronted with this embarrassing situation, instead of thinking of punishing the guards who deserted their post, they resorted to bribing these guards and the Roman soldiers. They paid each of these twenty men a sum of money and instructed them to say to all: "While we slept during the nighttime, his disciples came upon us and took away the body." And the Jewish leaders made solemn promises to the soldiers to defend them before Pilate in case it should ever come to the governor’s knowledge that they had accepted a bribe. The Christian belief in the resurrection of Jesus has been based on the fact of the "empty tomb." It was indeed a fact that the tomb was empty, but this is not the truth of the resurrection. The tomb was truly empty when the first believers arrived, and this fact, associated with that of the undoubted resurrection of the Master, led to the formulation of a belief which was not true: the teaching that the material and mortal body of Jesus was raised from the grave. Truth having to do with spiritual realities and eternal values cannot always be built up by a combination of apparent facts. Although individual facts may be materially true, it does not follow that the association of a group of facts must necessarily lead to truthful spiritual conclusions. The tomb of Joseph was empty, not because the body of Jesus had been rehabilitated or resurrected, but because the celestial hosts had been granted their request to afford it a special and unique dissolution, a return of the "dust to dust," without the intervention of the delays of time and without the operation of the ordinary and visible processes of mortal decay and material corruption. he mortal remains of Jesus underwent the same natural process of elemental disintegration as characterizes all human bodies on earth except that, in point of time, this natural mode of dissolution was greatly accelerated, hastened to that point where it became well-nigh instantaneous. There is a nice write up in the Calgary Herald by Mario Toneguzzi about Man of the Shroud exhibition coming to Calgary: St. Peter’s Roman Catholic Church hosting unprecedented event. There is a lot more than details about the exhibition. I recommend the entire article. 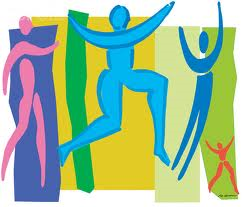 The exhibition takes place from April 9-15 at [St. Peter’s Roman Catholic Church] located at 541 Silvergrove Dr. N.W. Admission is free but donations are also appreciated. For more information about when the exhibit is open and the times for presentations, visit the church website at http://www.st-peters.ca. The April 15 event is by ticket only admission and it will be streamed live online so people not in attendance can see it. 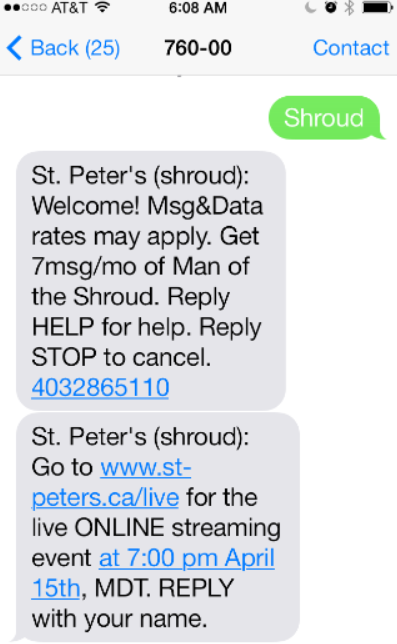 By texting the word shroud to 76000, people can find out more information and be kept informed about the event. The text message worked. What is says us go to www.st-peters.ca/live on April 15, at 7:00 pm MDT to watch the streaming. Hopefully it will be taped and put up on YouTube. The Shroud that Defies Scientific Explanation? Larry Shapiro isn’t interested in arguing over whether there is a God or not. But if you ground your belief in God on a belief in miracles, then the UW-Madison philosophy professor has a problem. 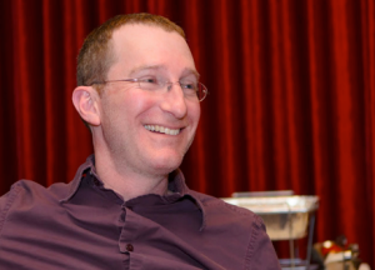 “Belief in miracles is irrational given the evidence to date — you don’t have the reasons you need,” Shapiro told about 150 people at a recent public talk on campus, part of an ongoing series in which UW-Madison philosophers tackle contemporary issues. This speaks to the credibility of the witness or witnesses, another important notion, Shapiro said. In order to believe in the purported resurrection of Jesus Christ, for instance, a reliable source is critical, he said. Yet the Gospels were written decades after the purported resurrection by unknown authors, and the scribes who eventually copied the original documents were sometimes illiterate or had religious agendas and would adapt the documents they copied as they saw fit, he said. Regarding Sunday’s In the Spirit column, "Belief in miracles ‘irrational,’ UW philosophy professor says," professor Larry Shapiro’s argument that belief in miracles is irrational rests upon two assertions. First, inexplicable things that happen actually have some natural explanation but we haven’t figured it out yet. And second, there is no plausible evidence of miraculous events. The first argument is silly and the second one is false. Just because primitive people put spiritual labels on medical conditions or events that have a natural cause does not mean there are not inexplicable occurrences that defy logic. For example, the Shroud of Turin is a religious artifact that defies scientific explanation for the time and place of occurrence, and even today for that matter. The New Testament provides plenty of proof of miraculous events, especially and including the resurrection of Christ. These reports were given by eyewitnesses and verified by people who suffered torture and death in defense of their testimony. There is no proof there were not earlier reports before the mid to late first century. Absence of proof is not proof of absence. There are thousands of documented near death experiences that defy rational explanation that excludes the existence of a supernatural soul. Defies scientific explanation, is that good enough? How often we try to get away with that. Look for me to make this question into another two or three postings. As my friend John Klotz draws near to the end of the book he is writing on the Shroud of Turin, he is asking again for some feedback on one part of what will be Chapter 16. He has posted some of the text in his own blog, Quantum Christ. Please have a look at The Triumph of Love and comment here or over on his blog. This book has defined God as the primordial consciousness which birthed the cosmos. In attempting to unlock the mystery of creation of both the Universe and our own consciousness, we have to rely on such objective facts as we can ascertain and the inferences and conclusion we can draw from them. The written Gospels are in themselves material facts whatever their veracity. So too is the Shroud of Turin. Can these material facts help us untangle the Gordian knot of our own existence. Do they in fact verify each other? A homage to Christ’s imprinting . . . ? 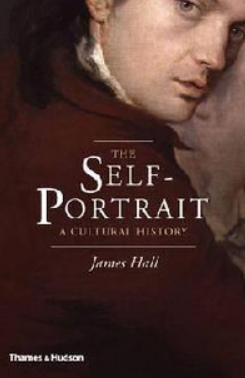 Peter Conrad’s review in The Guardian yesterday of Jame Hall’s book The Self-Portrait: A Cultural History begins in the middle ages . . . The images James Hall discusses in his enthralling book are therefore exercises in self-appraisal, not self-celebrations like the happy snaps on Facebook. Unusually, Hall’s history begins in the middle ages, because for him self-portraiture emerges as a reflex of Christian conscience, a homage to Christ’s imprinting of his agonised face on the Turin shroud. But the imitation of Christ takes courage, and it usually ends in the artist’s self-castigation. Think so? It’s opinion, but it’s an interesting thought. NASA had nothing to do with it. 3D elevations from brightness maps, often called height fields. How many times have we read something like this? the Shroud uniquely has 3D information embedded in the image, which was only discovered by NASA scientists in 1976. Or heard something like this, in this case from a recent Simon Brown video? 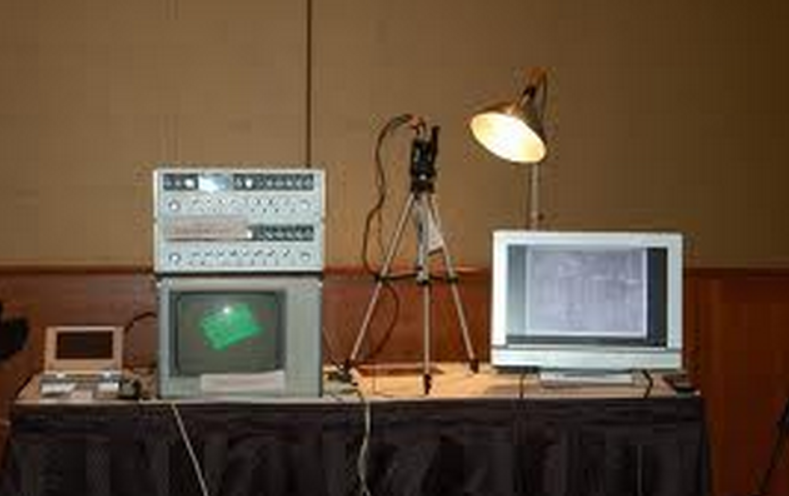 Peter Shumacher, the inventor of the NASA VP-8 Image Analyzer, describes the discovery of the 3 D image. NASA had nothing to do with it. Really. It was not the NASA VP-8 Image Analyzer. And Peter Shumacher did not invent it. The VP-8 was purchased by William Mottern of Sandia Laboratories from Interpretation Systems to use in the examination of the x-rays they were making at the lab. Bill felt it was another way to extract image data from nearly monochromatic x-rays. He originally saw the VP-8 advertised in a trade journal and bought one. Shortly after the Shroud image was placed into Bill’s VP-8, Jackson and Jumper purchased one for STURP’s use and the man who came to install it was Pete Schumacher, founder of the New Mexico Shroud Museum in Alamogordo. Two of our team members were from the Jet Propulsion Laboratory and were directly involved in the space program. 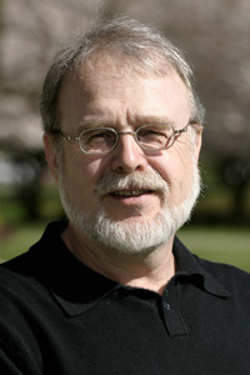 Don Lynn was in charge of imaging on the Voyager, Viking, Mariner and Galileo projects. At some point in time, some journalist out there wrote erroneously that the VP-8 was used in the space program and it seems to have stuck and become part of Shroud “mythology.” JPL had far more sophisticated technology than the VP-8. Just to clarify Barrie’s comment on one point, as Pete Schumacher tells it, the VP8 was donated by Interpretation Systems to Jackson & Jumper for their work. I’m fairly sure they didn’t have the $25k it would take to purchase it then. Pete agreed to deliver and install it if the company would pay for the gas. This was Pete’s introduction to the Shroud and he had no knowledge prior to seeing the 3D green screen image in Jumper’s basement. He knew the VP8 did not do 3D, but made brightness maps as one of its functions. A page at shroud.com, a description of one of the 1978 Examination Photographs, provides more information. After discussing how “Fr. 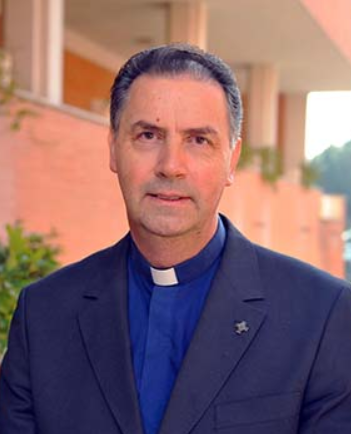 Angel Fernandez Artime [pictured], a Spaniard who most recently served as provincial in southern Argentina, was elected rector major of the Salesians of St. John Bosco March 25,” in several paragraphs, a story from CNA/EWTN concludes with these two paragraph. As rector major, Fr. Fernandez will oversee the Salesians’ celebration of the 200th anniversary of the birth of their founder, St. John Bosco. The celebrations will begin Aug. 16, 2014, and will end Aug. 16, 2015. In the midst of celebration, an exposition of the Shroud of Turin will take place, and it is possible Pope Francis will visit Turin next May to venerate the Shroud and take part in celebrating St. John Bosco. I imagine that every story about the upcoming 200th anniversary of the of St. John Bosco’s birth will be tagged with the Shroud exposition.